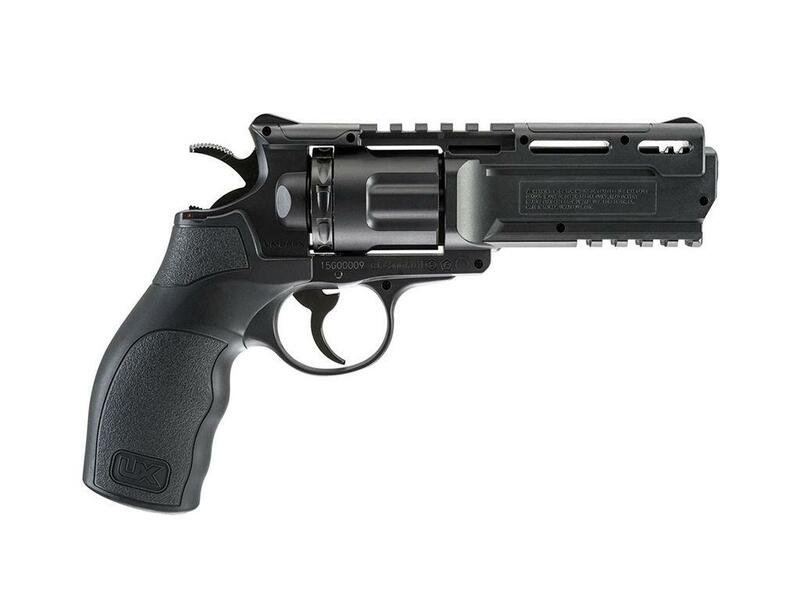 Umarex Brodax BB Revolver 4.5mm CO2 | ReplicaAirguns.ca | Easter Weekend Sale! Accuracy: I can not comment so far on the shooting performance for the Umarex Brodax CO2 BB Revolver since I have not shot it yet. The weather is getting nicer outside so that should happen pretty soon. 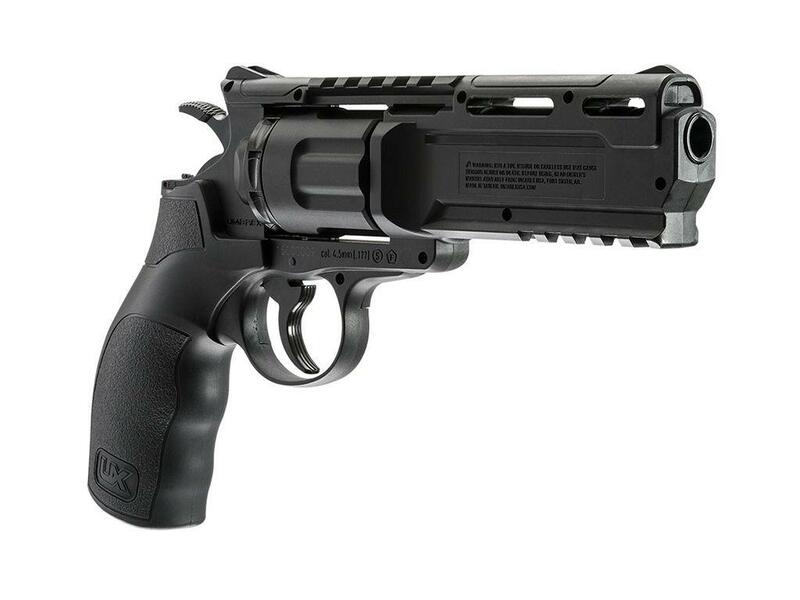 The claimed FPS for the Umarex Brodax CO2 BB Revolver is stated at only 375 which I find seems a bit low for a non-blowback fairly straight forward BB pistol with an almost 6 inch barrel so hopefully my testing shows performance up into the 400's which I am hoping for. The open sights are non-adjustable but there are tons more options by taking advantage of the two rails top and bottom for adding either a red dot or laser to increased target shooting ability. Build Quality: The Umarex Brodax CO2 BB Revolver is pretty much an all metal pistol with the outer shell being made up of plastic, there is a fair bit of internal metal going on along with the trigger, hammer and of course the inner barrel made out of metal parts. 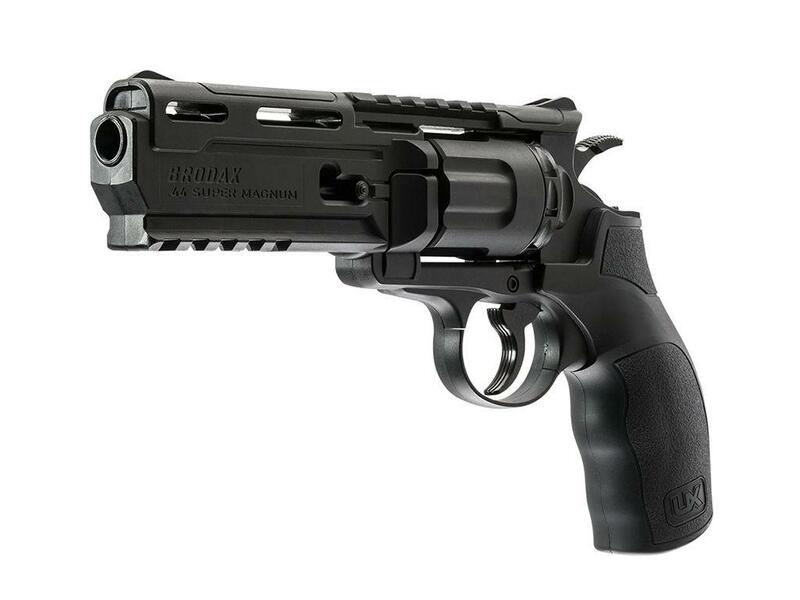 Mechanically the Umarex Brodax CO2 BB Revolver feels solid and even though it only weighs in at 1.3 pounds it feels much heavier in the hand. Realism: The Umarex Brodax CO2 BB Revolver as far as I know is not an exact replica of any real steel gun currently in production. It's basically a spin off of an ultra tactical .44 magnum revolver with a super beefed up front barrel assembly sporting all kinds of accessory options to be placed on the top and bottom rails. I like that Umarex made sure to recess the barrel opening so it has a more realistic barrel size. Like many new CO2 airguns coming out these days the CO2 is not only well hidden inside the grips but a handy Allen key is built into the handle. Grips are a bit hard to remove to get at the CO2, may work in over time? The Umarex Brodax CO2 BB Revolver when I first picked it up did not appeal to me all that much, maybe knowing it was for the most part yet another mostly plastic BB revolver with those thin pop in disc magazines didn't help me take notice much. 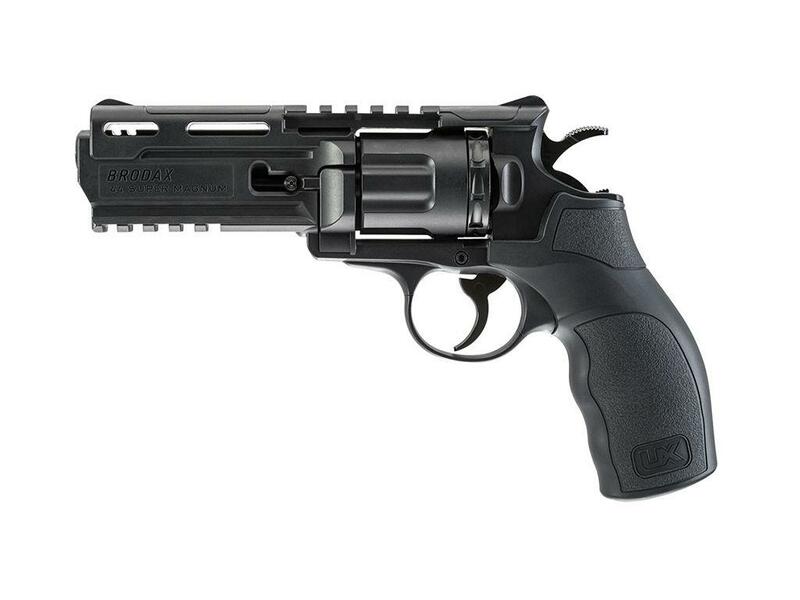 But as I have been playing around with the Umarex Brodax CO2 BB Revolver it has grown on me a lot. I think it has a really cool look that is also very usable in terms of putting just about any accessory you want on this CO2 revolver. The hammer and trigger action are also both excellent for not just an inexpensive airgun but even a higher end airgun. And right out of the box, or should I say clam-shell plastic wrap, you get three rotary disc magazines which is a nice bonus. Very nice gun. The look is so cool, feels like it’s a powerful revolver. Nice add to my collection, the shipping is so fast, thanks. All time best air gun for cost! Title says it all! For this price you wont find a gun which hits every mark. Its strong, accurate, cool looking. What more could you want!?! Plus if you're a fan of Blade Runner this strongly resembles the Blade Runners service pistols! I would love to see an upgraded version of this gun! Maybe some wood and nickel, more metal, pellet support? I would happily pay double for a more flashy version! Looks pretty similar to the hero gun from a certain sci-fi film. I immediately installed a rifled barrel into mine and drilled the magazine to accept pellets, then reworked the trigger a bit. These are easy to work on!! Accuracy is even better with the new barrel and pellets. With BB's these are still decent and break bottles. The double action is so-so in my book, I'm not a fan personally. Single is a little better, but the white metal used on most of the internals dulls it and give you a clunk rather than a click. Still, for the price and styling it's a moot point, this thing is great value and is easy to tinker with. Even being polymer it has a solid feel and the safety is simple to actuate and works well. 5 stars from me on this deal, get one before they're gone. I bought this at another retailer before discovering replica airguns.ca.Its an inexpensive polymer gun but I really like the crazy styling( reminds me of the revolver in the movie Hellboy).It's a little under powered but surprisingly well made and solid. The single and double action is excellent with a satisfying clink when cocked. Overall I think it's a great plinker. -Materials: Mostly plastic with some metal construction. -Weight: 1.3 pounds (586 grams). -Action: Revolver, single & double actions. -Ammunition Type: 4.5mm steel BB's. Make sure to checkout my Table Top Video and Written Review for the Umarex Brodax CO2 BB Revolver where I show you around this Russian made target pistol and go over its features and specifications. This Field Test Shooting Video Review focuses on the performance aspects of the Umarex Brodax CO2 BB Revolver. I test it out to see what kind of velocity it can achieve as compared to the 375 fps Umarex states and I also conduct an accuracy test form 30 feet away to see how straight and true it shoots.